May 1958 cover. 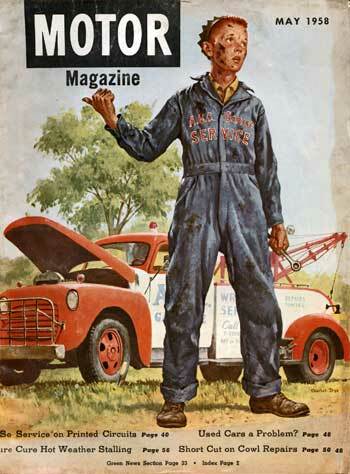 On a spring day, a tired young tow truck driver from ABC Garage, wearing grease-stained coveralls and holding a wrench in his hand, thumbs a ride back to town after his tow truck breaks down and he fails to get it started. Born in Cañon City, Colorado, Charles ("Charlie") Robert Culbertson Dye, III, (October 30, 1906 — January 22, 1973) was an adventurer, illustrator, and painter of Western genre scenes. As a kid, he liked to sketch but he loved horses and just wanted to be a cowboy. He completed high school and, by age 17, had sufficient skill as a cowhand to ride with herds for ranches in Colorado, California and Oregon. He carried a sketch pad in his saddle bag and sketched whenever he could, just as other cowhands might whittle or play harmonica to pass the time. He drew what he knew, i.e., sketches of cowboy life, and he learned to spin a yarn — in sketches as well as in swapping tales over a campfire. In 1923, though, a black bronco threw him (and/or fell on him, depending upon the story version), and he broke his leg, landing in the hospital for quite some time. While recovering, an old codger in the bed next to his showed him a book of famed artist Charles Russell's Western pen-and-ink sketches. Thinking he could make a living with cowboy sketches was a Eureka! moment for Dye, one his father wished he hadn't had. The story goes that his dad rated artists a rung lower than pimps. In 1932, Dye, despite the disapprobation, struck out for Chicago to work in the cattle yards and see what more he could learn about art, studying nights at the Chicago Art Institute. It was hard knowing which of Charlie's stories to believe but he claimed that, while in Chicago, he also had a go as a semi-pro football player and as bodyguard to a politician, or Al Capone. Hey, you never know. It's definite, though, that Dye also took night art classes at the American Academy of Art, starting in September 1933 and studying under illustrator and graphic artist Carl Arthur Schmidt. Dye's move to New York City came in 1936. He had adjusted to the notion of being a cowboy in a big city and opened a freelance studio, still studying at the Grand Central School of At with Harvey Dunn, a painter/illustrator from the South Dakota prairie. Dye's early assignments were to illustrate stories inside the pages of Western pulp magazines published by Popular Publications. He soon branched into cover art for other magazines, as well. Exempted from service during World War II, perhaps because of the earlier leg injury, he was at somewhat of an advantage in the art market. Many other artists and illustrators had been called to service, and art directors went looking for fresh talent to fill the gap left by their departure. It was Dye's first appearance in publications such as the Saturday Evening Post. Over time, he would also provide illustrations to these publications: American Weekly; Adventure; Future; Outdoor Life; Argosy; Saga; Fifteen Western Tales; Planet Stories; Future; Western Horseman; Arizona Highways; Walt Colburn's Western; MoToR; and Coronet. He would also provide advertising illustrations for Buck Skein Joe jackets; Gilbey's Gin; Ron Merito rum; Aetna insurance; Esso oil (for Christmas cards, calendars, and stickers); and other campaigns. Dye earned enough from illustrating that he could own the thirty-four foot schooner "My Wife", which he skippered in the late forties. In 1950s New York, illustrating work was harder to come by as photography replaced illustrations, so Dye considered other possibilities. He left the world of commercial art, returned to Colorado, established a studio in Denver, and became a partner and instructor at the Colorado Institute of Art. His concentration once again was on Western art. In 1962, he moved on from teaching and settled in Sedona, Arizona, where he became more widely known for his oil paintings. In 1964, he joined two other Western artists — Joe Beeler and John Hampton — on a cattle roundup to Mexico. Together, they hit upon the idea of renewing interest in high-quality, authentic art representative of the American West. As a result, in 1965, Cowboy Artists of America debuted; Dye was a member from 1965 to 1973. Dye's works are included in a number of museums, including the Eiteljorg Museum of Art; National Center for American Western Art; National Cowboy Hall of Fame; National Cowboy and Western Heritage Museum; Rockwell Museum of Western Art; and Sangre de Cristo Arts Center. Towards the end of his life, Dye suffered from terminal cancer. On January 22, 1973, he died of a self-inflicted gunshot wound.